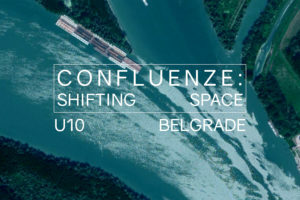 What does “shifting space” mean? A space that shifts is a space that is subject to change, that fluctuates from shape to shape and from one conformation to another, assuming new physical and conceptual directions. Our interest is focused on filming the ways in which the space gets related with the phenomena of presence and perception, since the perception of a space requires the presence of an observer, and this is always influenced by perception and position. The works of Anja Dimitrijević, Paloma Leyton and Laura Santini evoke impressions and awareness of different spaces: a viewing point in Jerusalem, a public square in Nîmes, natural rock formations in Lessinia, the horizons of Argentina, Spain and France and a theatrical, abstract space that is susceptible to imagination and a research on new forms. We became aware that our videos shared recurrent ideas, so we decided to show them in one unique repertoire. While our ways of perceiving may vary, explorations of time, distance, geography and measurements are concepts that commonly emerge from our group. Our call to focus on perception is an invitation to listen and to contemplate, both the matter that surrounds us and the matter that forms our body. As human beings, while we live, we perceive and we inhabit. We move slowly through a complex landscape, shaping the space as we go. The surface we create with our presence is both a path and a map, and these are our traces, framed within a time continuity. In all the works presented, the point of view of the spectator/camera is an important element, since images of spaces are connected to the fact that perceiving is registering. And because visual stories have the power to transform spaces into places, the video is a tool that can modify space and introduce new qualities to it. Our research does not only want to create chronological cinematic narratives, but to bring out different elements of the perceptions of time (Déplacement d’atmosphère, Valle delle Sfingi), to explore the field using the body and its senses as a tool (Valle delle Sfingi, Horizontes) to rethink public space as completely emptied on one hand, or multiplied by the human presence on the other (Déplacement d’atmosphère, Scopus); or, to explore the forms of abstract space in the blackness of a theatre (Agrès-Sol). Exhibition catalogue may be found here.